Postcards from Manila: #33 How far away is that horizon? #33 How far away is that horizon? How far away is that horizon? "As far as your eyes can see." But how far is that exactly? It was shortly before sunrise. We were on the coast of Alaminos in Pangasinan facing east. 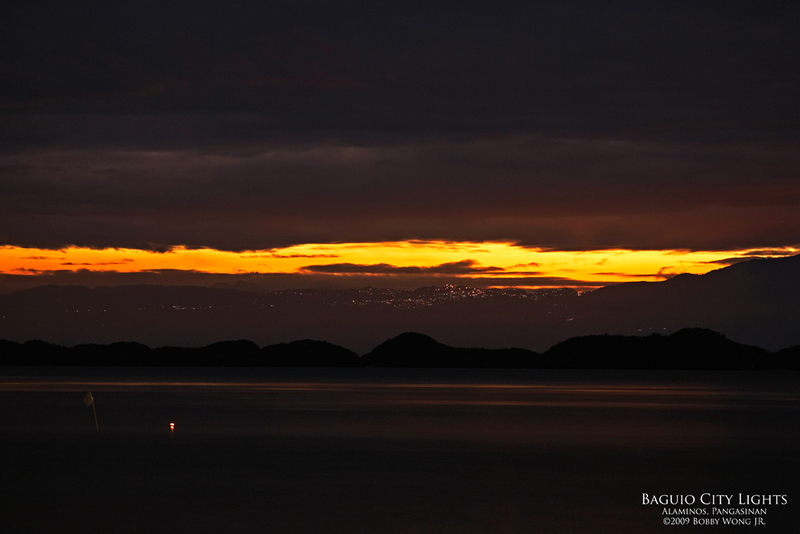 In front of us was the Hundred Islands Nature Park in the Lingayen Gulf, looking like a bunch of interconnected hills cloaked in the night. Further off and on the horizon is the Cordilleras Mountain range. Those pin lights atop the mountains, they are the city lights of Baguio City. Cool. Using Google Earth I took a straight-line distance reading between where we stood and Baguio City. Surprise, it was only about 67 kilometers away (about 42 miles.) Of course this shot was taken with a telephoto lens which magnified it 3.5X. But with the unaided eye the lights were still visible, if only barely. So the next time you look at the horizon and wonder how far it is, know that it's not that far away. Enjoy. Amazing and awesome picture. I love this kind of fotos and energy placed below. Makes me think there are people who are still hopeful about this planet! AL Jose Leonidas, teacher and magic entertainer. Ang ganda! I've been to Alaminos, Pangasinan twice. OMG! if im not mistaken that's San Carlos Heights. Lapit na kami dyan, sa Victoria Village ako. spectacular! you were able to capture the heart and soul of every scene! love all your photos! many thanks for sharing... more power!